So you have your henna, but now you don't know what designs to henna? No problem! Henna is all about building your henna vocabulary so that you can free-hand henna easily, straight from your heart (or head as the case may be). It helps to start by imitating different designs you encounter. You can find design ideas everywhere! The Henna Design Gallery section of our henna help site has HUNDREDS of henna design pictures! Get inspired! Our FaceBook Page has a ton of henna design pictures too. While on FaceBook make friends with other henna artists. Purchase henna design eBooks! 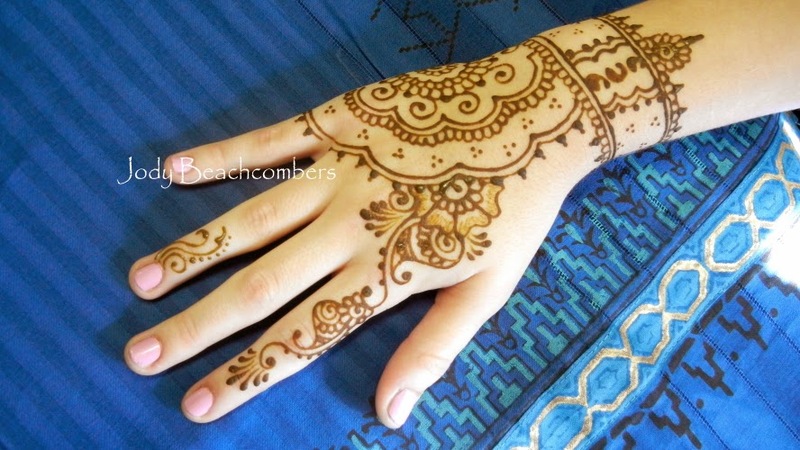 There is a great selection of henna eBooks at Beachcombers, but there are others out there. Look around and find them. Check out Google Images for ideas. Looking for a butterfly? Google butterfly and take a look at the images. You'll get a ton of ideas this way! Get inspired by everyday items around you. Jewelry, bedding, clothing, candle holders...you get the idea. * Keep in mind if you are using another artist's work you need to give them credit. If you want to post, print, or otherwise publish work from another henna artist, you need to get permission from that henna artist. With some practice you will find that you start pairing henna elements on your own. Before long you will have developed your own unique henna style! Remember to take pictures of your work when you can. You'll be able to see how much better you are getting and you'll remember different designs you've done in the past. Building your henna vocabulary is a huge help if you like to do one-of-a-kind henna or if you like to connect with the energies people project. Once you are no longer worried about the actual art, you can really connect with people on a personal level. You'll be shocked at how unique and personal some of the designs end up. Get started! Build that henna vocabulary! Purchase henna design idea eBooks here. I've added some new pictures to the post to give you more henna design ideas!